Most of the reasons why I was excited to find a real house involved the kitchen. A gas oven. Natural light for taking pictures. Storage space for all of the appliances I never could justify hoarding before. Fortunately, our new home meets these criteria, even if the basement is rapidly filling with shelves of serving dishes, grilling accessories, and…appliances that I can just barely justify hoarding. A waffle maker made the cut, and photographing my breakfast bounty bathed in natural light has reinvigorated my desire to cook, snap, and share. There was a time in college when I ate a lot of Eggos, toasted to a crisp in the oven. 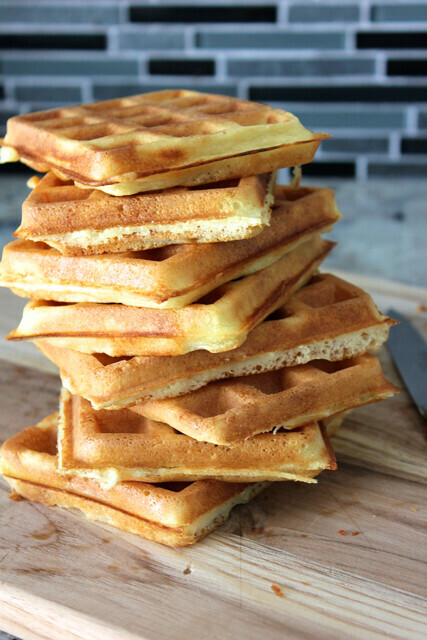 These waffles taste very similar, and given my yet to be replenished stock of standby food items, can be made from everything you probably already have in your pantry. There’s no need to go find buttermilk or let this dough rise. 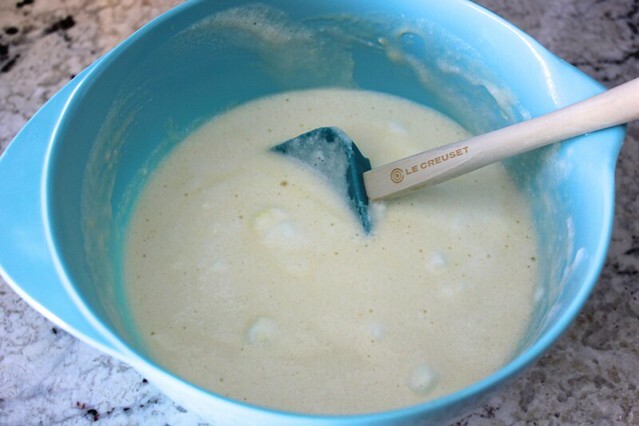 Just get a medium bowl, and whisk together 2 egg yolks (crack the whites into a seaparate large bowl), 1 3/4 cups of milk, and 1/2 cup of vegetable oil. In another large bowl, combine 1 3/4 cups of all-purpose flour, 1 teaspoon of baking powder, and 1/4 teaspoon of salt. 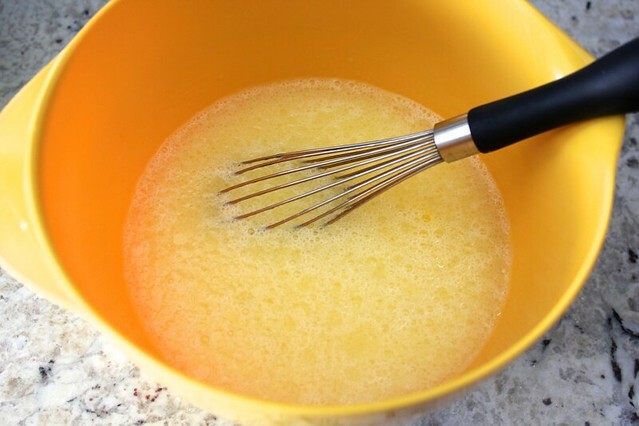 Pour in the egg yolk mixture, and stir it together using a spatula until it is just combined. 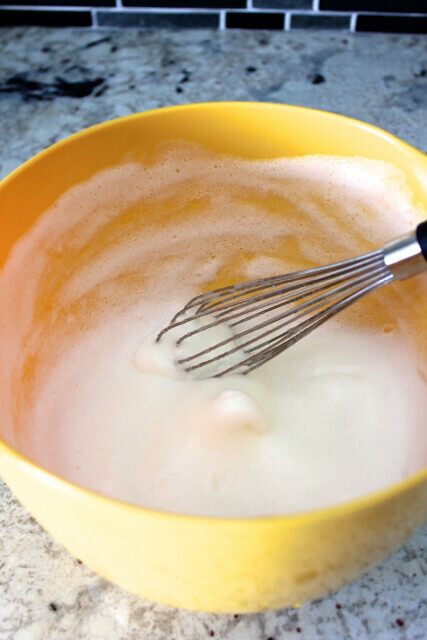 Turning to the large bowl with 2 egg whites, use a clean whisk to beat them until they hold soft peaks. You could use an electric mixer for this step, but an arm workout is always a good way to ready yourself for a waffle breakfast. 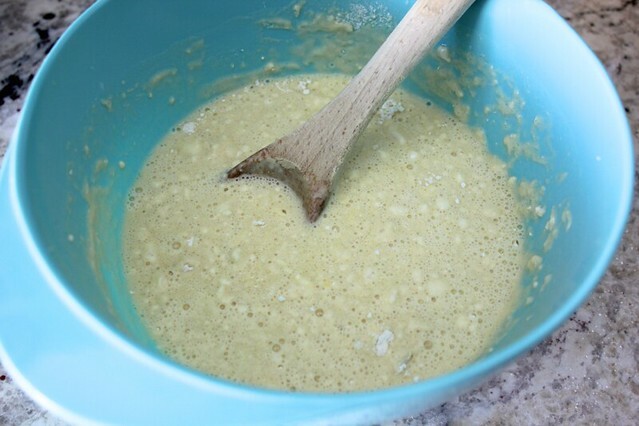 Add a dollop of the egg whites to the batter, and mix it in. Pour in the rest of the egg whites, and gently fold them in until they are just combined. 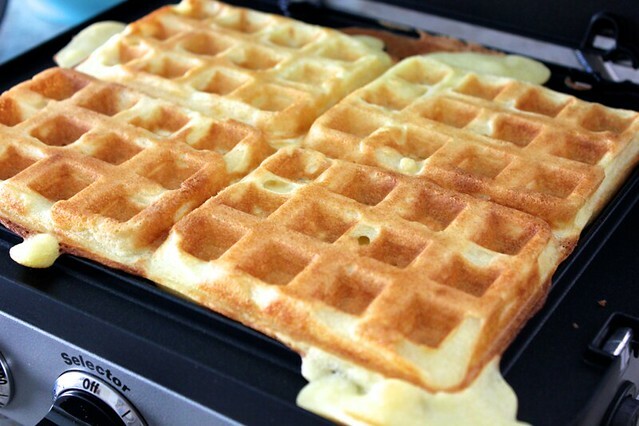 Pour the batter into a heated waffle iron, and let the waffles cook until they are golden brown. This step took 5-6 minutes in my waffle maker. I used that time to admire new baby Rue. She keeps me company in the kitchen. 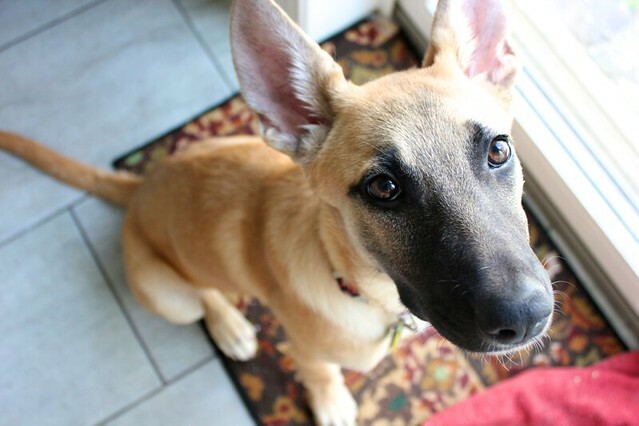 Don’t be fooled by her cuteness, she’s an energetic little devil. Stella appreciated having a break from getting her snout chewed. One of my favorite parts about waffles is the crispy edges. When I’m the cook, I get them all to myself. I can’t get enough of the natural light in this kitchen. 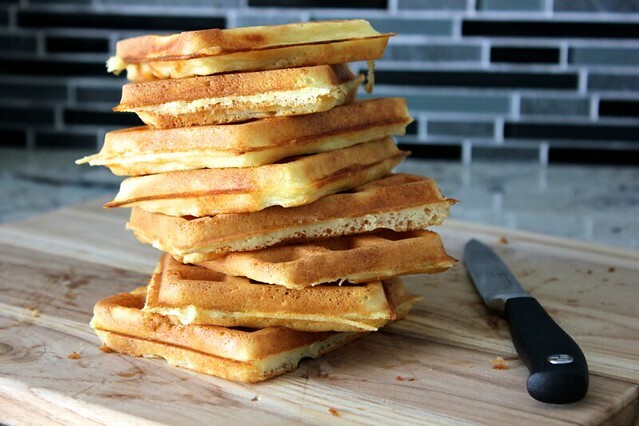 While you’re making batches of waffles, the already-made ones can sit on a cooling rack to stay crisp, or they can hold in a very low-temperature oven. Alternatively, if they get a little limp, you can stick them in a toaster just before serving. 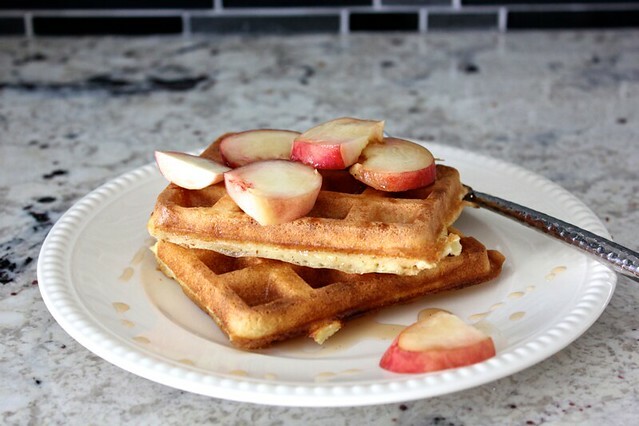 I served these waffles topped with sweet summer peaches and vanilla bean-infused maple syrup. So delicious! Any remaining waffles freeze perfectly and can be toasted individually for subsequent breakfasts or late-night snacks like in my college days. Fruit into the batter instead of on top? Must say GOOD JOB!!! I definitely thought about adding fruit into the batter, especially banana and chocolate chips. I figured it best to start simple and work my way up to more complicated waffles!